A while back, I set up some alerts so that I would be notified on specific new posts on Craigslist. I used the IFTTT website, which I use for multiple other things, like posting to Twitter, and emailing my Blog Posts. There are so many different capabilities that you should check out and see if they would work for you! If you're looking for specifics, feel free to contact me, too, and I can let you know exactly how I'm using it. Anyways, one of the alerts that I set up was for the IKEA Stornas Table, and every now and then, I would get an email when one was posted on Craigslist. In the last seven or eight months, a few have shown up, but they always get snatched up quickly. The extendable table, which is the one that I was looking for, is very popular since it's a solid wood table with two leaves and extends to 115"! But, finally, I was able to get my hands on one. A woman in Cambridge, MA was selling one that she had no use for anymore, so I talked with her about picking it up and on a Tuesday after work, my mom and I braved rush-hour traffic from Providence to Cambridge in my sister's SUV - a day I declared as "Table Day," since I had been looking forward to getting this piece for about a week before we finally picked it up. With only needing to remove the legs and the leaves, the table top fit in the vehicle with one end resting on the top of the driver and passenger seats and the other end resting on the floor of the cargo space. I had to slink down in my seat just a bit so that my head didn't hit the table, but it was worth it. My mom was a trooper though. She's so tiny, standing at just 5' tall, so her head was no where near the table top resting on the headrest of her seat, but she did help me carry the table into the house. When assembled, the table weighs about 170 pounds, according to the IKEA website, so even though the legs were off and the leaves were out, it still weighed a lot! I was so lucky to have her help, since I definitely wouldn't have been able to pick it up by myself. I washed it down when I got it home and then attached the legs and added in both leaves. There are a few dings and scratches in it here and there, but that was both expected and fine with me since I was able to purchase the table for a significant discount. Plus, I picked up some of the stain that IKEA sells so that I can do some touch-ups on some of the more visible spots. The most important thing, though, is that the table fits really well in the room, although Dylan actually wishes it was longer! We still only have two chairs, and they are a different finish, because I purchased them back when I had plans to build our dining table and stain it a nice rich brown, so we will probably re-evaluate now and try to figure out what we want the chair style to be. Maybe we'll end up sticking with the IKEA Borje chairs but just go with the black-brown finish instead of the brown. I can't wait to to style this table and the room, but as you can see in the background, I still need to add the chair rail molding and get the room painted, so that's next on the list for this space. What kind of styling do you think I should do for this table? Keep in mind that we have two cats, so tall or breakable items aren't really conducive to every-day decor. Also, with a table of 115", do I make a gigantic runner to put down the middle? Help please! The last time I was around these parts, it was April. It's now July, and I guess all I have to say is SORRY!!! We have been so busy with house projects, landscape projects, family things, and I just haven't had any motivation to sit down and write, although I have tons of stuff to update you on. I hope that you're still with me, and interested in how our house is being transformed into our home. I've got some great DIY projects to tell you about, and some other things too, like a BIG project that we have been keeping secret, and my recent obsession with HomeGoods! For now, let me tell you about a great opportunity that presented itself to me just after I dropped off the radar. 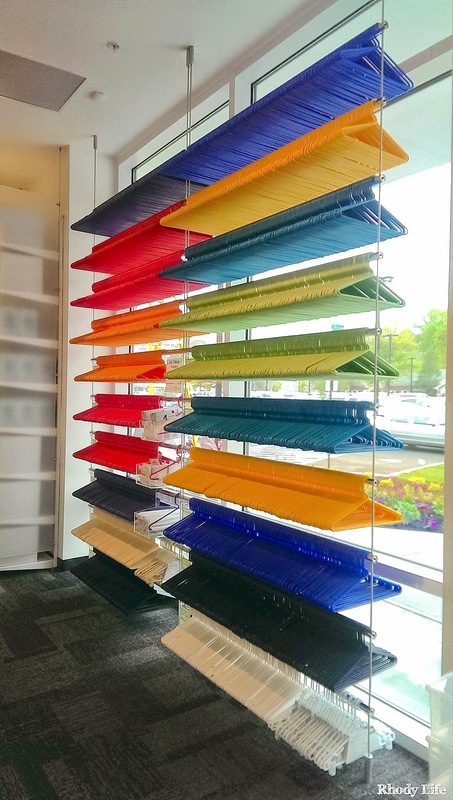 As a Rhody Blogger, I was invited to a preview of the new Container Store that opened up in Cranston in May! It was amazing. 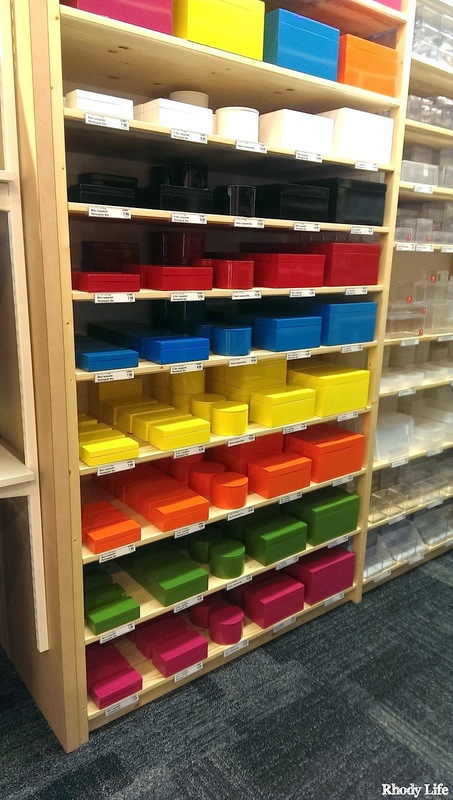 This place is essentially made for OCD organizers like me, and the fact that it was full of so much color was enough to have me jumping at the gun for a chance to get in there! 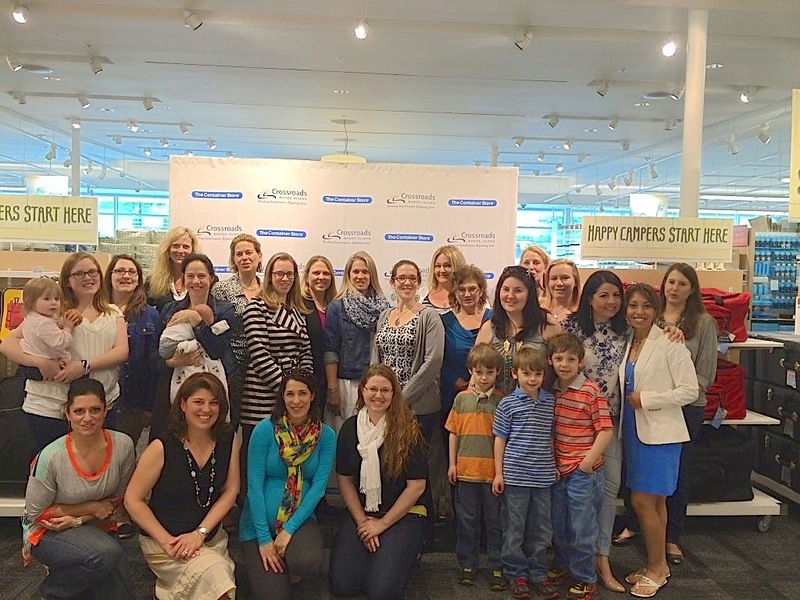 The blogger preview was a luncheon, where we not only learned about the philosophy of The Container Store, but we were also able to speak with the marketing manager about the perks of working for the company, and some of her favorite products. After our chat, we were brought around the store for the grand tour of the 25,000 sq. ft. space! I have to say that not only was the store very organized, as expected, but it was colorful, and fun. I found things that I didn't even know that I needed, and it was so hard to not just take the items off the shelves and bring them home with me. 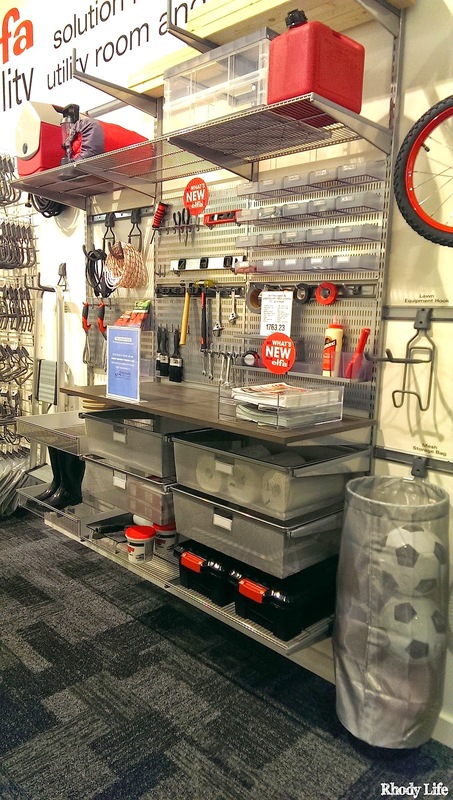 From colorful hangers to coordinate with the color of the shirt or pants you are hanging, to an amazing garage storage solution using The Container Store's most popular product - the Elfa Closet System - this store literally has everything you could need for organizing your home. 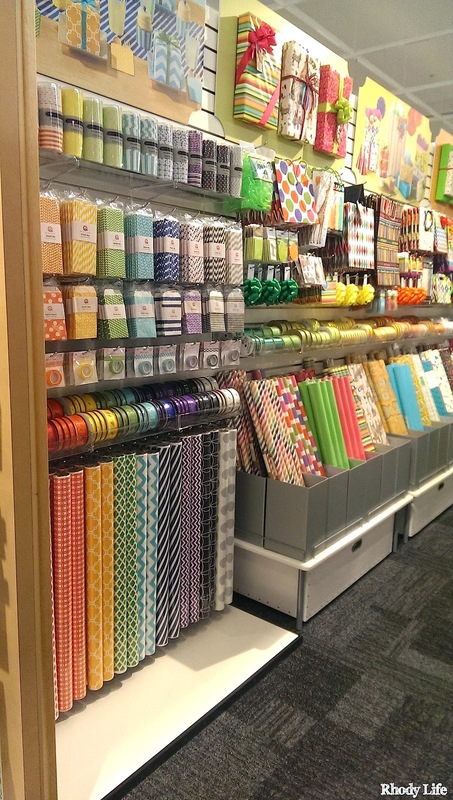 One of the most surprising things to see was their gift wrap area. I didn't even know that chevron wrapping paper and tissue paper even existed, but you know now that I won't go anywhere else when I want to wrap a gift as creatively and stylishly as possible! And one of my most favorite things was this this area of storage boxes, and the ones in particular that I was obsessed with were the lacquer boxes available in all of the colors. I just wanted to buy one in every color even though I didn't have a place for them, or anything to put in them. After the tour and the lunch, we left The Container Store, but were invited back for the Preview Party that night, with delicious catered food, served in all of the different containers that were on the shelves. I'm talking sandwiches laid out on paper trays, and Lo Mein served in Chinese Gift Box containers. It was creative and unique, and with drinks flowing and a band playing, it was a store opening that I would have never expected, but will also never forget. It was so fun to see people from across Rhode Island come together to celebrate a store opening, and I'm sure that while items could not be purchased during the party, that many of the guests returned that weekend to make purchases. And since then, I have been to the store three times. And I actually made a list online of all the items that I wanted and it totaled over $1000. And that was a generous list that I narrowed down after browsing their site for a few hours. If you haven't been already, you should definitely make it a point to go. They will have products that you didn't know existed, and then you will buy all the things. So now, you must stop reading this blog post and make your way over to The Container Store today, or at least this weekend. Go! Now!